Canon PIXMA MG5550 Review - A high-quality Wi-Fi All-In-One for the home with print, copy and scan functions. Features include 5 Single Inks, advanced connectivity for smartphone and direct cloud printing plus XL ink options. With advanced Wi-Fi connectivity and 5-ink system this All-In-One printer offers easy, high-quality print, copy, scan function as well as direct cloud access. It is designed to be used and shared wirelessly around the home and remotely from mobile devices. For ultimate flexibility, you can control your printer directly from your smart devices. Download Canon PIXMA Printing Solutions app to print from, and scan to, your smart device as well as cloud services. With the app, you can even check printer status, user manual or ink levels. Apple AirPrint and Google Cloud Print support are also provided. Ideal for speedy, quality printing at home, it has a rapid ISO ESAT A4 document print speed of 12.2 ipm mono/8.7ipm color and prints a 10x15 cm borderless photo in approx. 44 seconds. A clear 6.2cm display makes it easy to view selected functions or use cloud services. Auto Power On automatically turns the printer on when you start printing from a PC or mobile device on the same network. Enjoy the freedom to print directly from the internet with enhanced PIXMA Cloud Link. 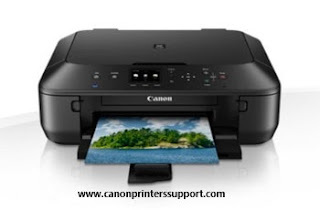 Print photos in seconds from Facebook, Twitter and online albums like CANON iMAGE GATEWAY or print documents from cloud services like Evernote and Dropbox directly from the printer screen. Produce calendars, download stationery and other templates direct from the PIXMA Cloud. For greater economy, this All-In-One features 5 single inks, so you only need to change the color that runs out - making printing more efficient. Dedicated document black and photo black inks together with Canon’s FINE technology and up to 4800dpi print resolution deliver sharp text and images with great levels of detail. Optional XL inks let you print more pages than a standard ink, so need replacing less frequently – ideal if you print a lot - and can offer savings of up to 30% per page. Auto 2-sided printing reduces the amount of paper you use and creates professional looking double-sided documents. One-stop software with solutions for organizing and printing your photos, scanning and accessing online services. Advanced features like face recognition make it easy to search through all the photos on your PC and find the ones you want.